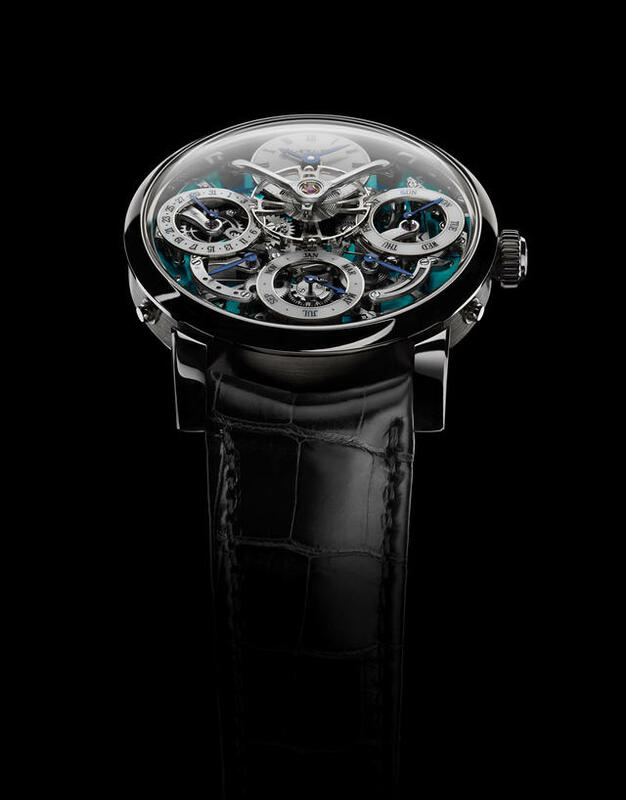 MB&F's pre-Baselworld 2018 announcement in one sense lightens its Legacy Machine Perpetual, the independent company’s heaviest complication. 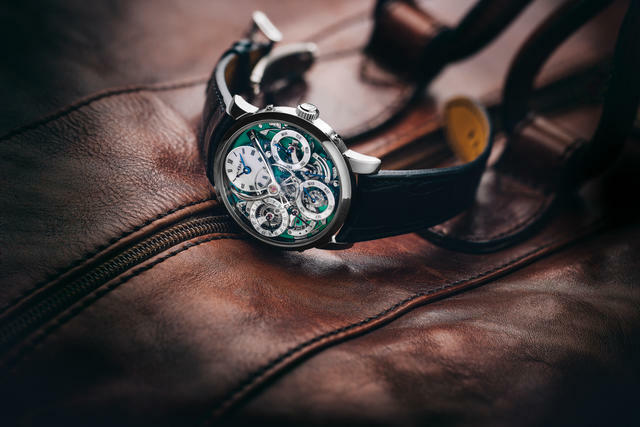 Now with a titanium case and familiar blue-green accent, the new LM Perpetual will be available cased within a lighter, less precious metal than the previous gold or platinum models. 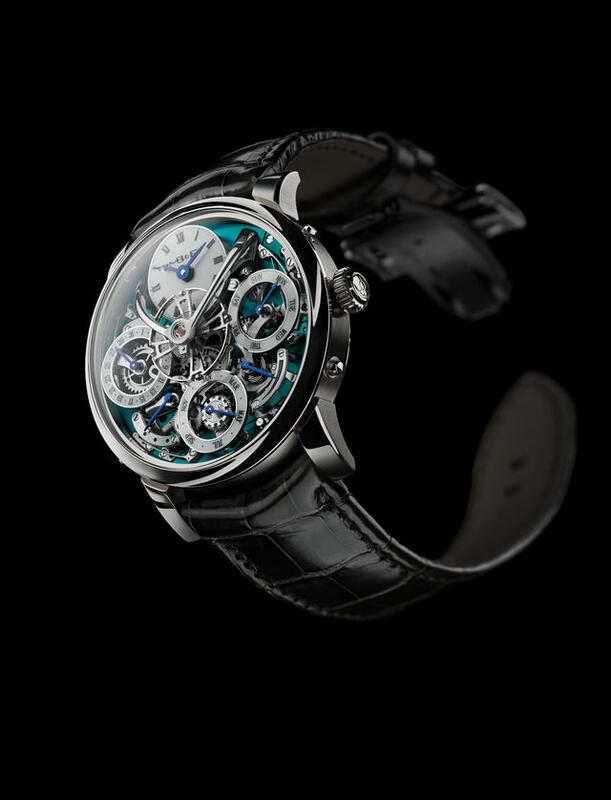 Despite its lighter case, the watch retains the same weighty technology inside. 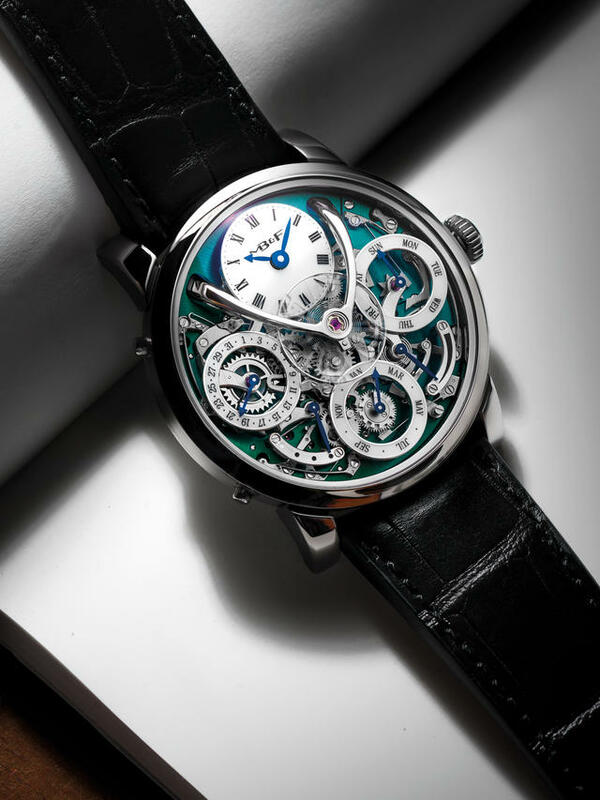 This newest LM Perpetual – limited to 50 pieces – offers the same groundbreaking LM Perpetual movement conceived by MB&F Friend Stephen McDonnell for the 2015 original. 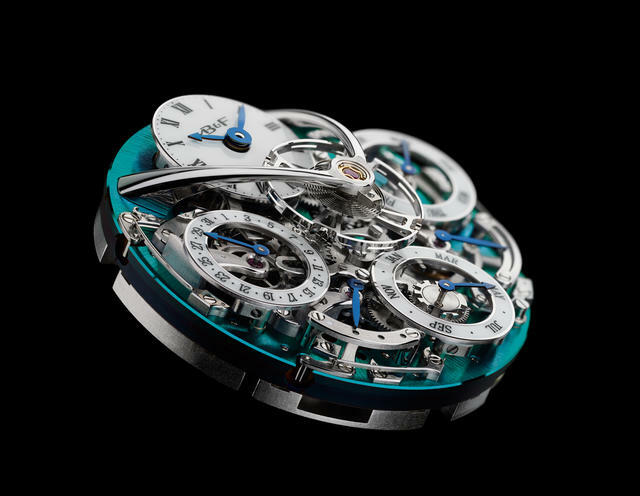 The upshot of his groundbreaking design means the Legacy Machine Perpetual will operate with no skipped dates or jammed gears. Owners often inadvertently create problems within their perpetual calendars by attempting to reset them while the gears are mid-function, resulting in some damage to the highly complex date mechanism. McDonnell’s design is proactive in a sense because when the user attempts to adjust the calendar, the movement’s pushers automatically deactivate so they don’t cause any damage to other components. At the heart of the difference is how the Legacy Machine Perpetual determines dates. Traditional perpetual calendars use a 31-day month as the default, changing, for example, from February 28 to March 1 quickly to arrive at the 1st. Interrupting the movement during this critical changeover can damage it. With this perpetual calendar movement, Busser and friends essentially replaced that traditional system with a mechanical processor that instead utilizes that default 28-day month and adds extra days only as required. This means that each month always has the exact number of days required built in to its system. The mechanism won’t fast-forward or skip redundant days, eliminating the chance that a user will interrupt the changeover process and damage the movement. What’s more, McDonnell’s design also makes it simpler to reset the date during a leap year. Where many traditional perpetual calendars require the user to scroll through up to forty-seven months, this new perpetual has a dedicated quickset pusher to adjust the year. This is the movement that in its initial version and with a gold or platinum case took the prize for Best Calendar Watch at the 2016 Grand Prix d’Horlogerie de Genève. It’s just as beautiful with its new skin. Price: $148,000. - and now in a titanium edition with blue-green face (limited to 50 pieces-pictured above). Fully integrated perpetual calendar developed for MB&F by Stephen McDonnell, featuring dial-side complication and mechanical processor system architecture with inbuilt safety mechanism. Manual winding with double mainspring barrels. Bespoke 14mm balance wheel with traditional regulating screws visible on top of the movement. Superlative hand finishing throughout respecting 19th century style; internal bevel angles highlighting handcraft; polished bevels; Geneva waves; hand-made engravings. Material: 18k 5N+ red gold, 18k white gold, platinum 950 or grade 5 titanium. Black, grey or dark brown hand-stitched alligator strap with gold / platinum / titanium folding buckle matching case material.